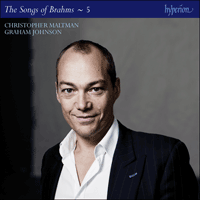 A new recording from renowned recitalist and winner of the Lieder Prize at the 1997 Cardiff Singer of the World Competition, Christopher Maltman. Graham Johnson is both accompanist and curator of this series that presents the entire piano-accompanied songs and vocal works of Johannes Brahms. As such it is a companion to the series undertaken by Hyperion for the songs of Schubert, Schumann, Fauré, Strauss and Liszt. This fifth volume presents the songs of Op 33, the only time that Brahms composed a song cycle as such, but even then his observations about how he wished his songs to be heard are worth considering; they are far removed from the contemporary orthodoxy. Brahms sets Tieck’s ‘novella’ Die wundersame Liebesgeschichte der schönen Magelone und des Grafen Peter von Provence (‘The wondrous love story of the beautiful Magelone and Count Peter of Provence’). A full account of the text and of the composition of this intriguing cycle is to be found in Graham Johnson’s erudite booklet notes. This is the fifth volume of a series that presents the entire piano-accompanied songs and vocal works of Johannes Brahms. As such it is a companion to the series undertaken by Hyperion for the songs of Schubert, Schumann, Fauré, Strauss and Liszt. Each recital represents a different journey through the repertoire (and thus through Brahms’s life). In a number of these recitals an opus number will be presented in its entirety. In the case of this volume it is the songs of Op 33, the only time that Brahms composed a song cycle as such, but even then his observations about how he wished his songs to be heard are worth considering; they are far removed from the contemporary orthodoxy. Johann Ludwig Tieck (1773–1853) was born in Berlin, studying philosophy and theology in Göttingen and Erlangen. In Jena he met Herder, Friedrich Schlegel and Novalis, and he also knew Schiller and Goethe. He quickly became renowned for his skills as a novelist, fabulist and writer of comedies, sometimes using the name ‘Peter Leberecht’. This ‘Peter Liveright’ was the author, in 1797, of the first version of Die wundersame Liebesgeschichte der schönen Magelone und des Grafen Peter von Provence (‘The wondrous love story of the beautiful Magelone and Count Peter of Provence’). This was an early example of the Romantic novella, a new art form, and it was among the works that brought Tieck fame and popular recognition. The story reappeared in the collection Phantasus (1812) and again in the poet’s collected Schriften of 1828 (which Brahms owned). Although Tieck is not an important figure so far as the lieder world is concerned—there are too few settings of his work—he was second only to Goethe in terms of the esteem in which he was held in the world of German letters. After Goethe’s death he was counted the greatest living German poet. There are Tieck settings by Reichardt (father and daughter), Zelter, a fragment by Schubert (Abend, D645), Spohr, Weber, Fanny Hensel, Loewe, Mendelssohn and Robert Franz, but none of these works comes anywhere near to the importance of this Brahms cycle. In his remarkable book The Songs of Johannes Brahms (2000) Eric Sams writes movingly about the affinities between the composer and the hero of Brahms’s cycle, Peter of Provence: ‘Both were romantic heroes, young men of passionate self-awareness in search of a destiny and an identity.’ One wonders if Brahms himself ever made these connections; we sometimes fantasize about our heroes’ enthusiasms and are way off the mark. Sams also writes of the difficulties that the cycle (five books of songs with three numbers each) had encountered—refused by Breitkopf & Härtel (the first publisher Brahms approached) probably on account of its musical difficulties, and put to one side ever since by countless tenors and baritones for the same reason, not to mention female singers who are excluded, these days, from participation. But the challenges of the cycle, both vocal and pianistic, are not the only reason that this work has never become as well known as the two Schubert cycles, Die schöne Müllerin and Winterreise. Those works, if performed complete (as they almost always are in our own time) have the advantage of a certain, if not complete, narrative clarity: their stories, so far as they go, unfold naturally with the music. This is not the case with Die schöne Magelone, where even a full translation of the lyrics is insufficient to reveal their significance in the context of the story. In Germany of course Tieck’s narrative is sometimes read aloud in the original, although it is almost always somewhat shortened to make the entire evening a tolerable length—the work has to be heard without a break in one sitting. Because the songs, when sung together, take nearly an hour, recordings of the cycle in Germany (where full justice must be done to the work of Tieck, an immensely important literary figure) have often extended to two hours, or more. Cutting Tieck’s story down in terms of its length is a great deal harder in the original German than in English. Once the work is presented in German, justice has to be done to its celebrated prose. Some of Tieck’s extended descriptions are remarkably beautiful and atmospheric, though not essential to the story-line. If only the words essential to the plot are to be included, scant justice is done to the descriptions that made Tieck such a revered author, and the problem is exacerbated by the fact that there are two substantial sections of the story where Brahms failed to make musical settings, but which must still be covered from the point of view of the narrative. Meine Magelone Musik hat nun einmal durchaus nichts mit dem Phantasus und der Liebesgeschichte vom Peter zu tun. Ich habe wirklich bloss die Worte in Musik gesetzt und es geht niemand dabei die Landschaft oder das Hospital oder sonst was an … Die Engländer aber mögen doch drucken, was sie wollen—sehr gern—nur um Gotteswillen, Sie nichts in unsere Ausgabe der Lieder. My Magelone music has categorically nothing at all to do with Phantasus and Peter’s love story. I have just simply set the words to music, and the landscape or the hospital are of no concern to anybody. The English can print whatever they like—let them go ahead—but don’t you put any such thing in our edition of the songs. Far from dreaming of complete evenings of his songs in public performance, Brahms preferred to hear no more than three of his own songs in any one concert. This astonishing information comes from an invaluable book of essays—K Hamilton & N Loges, eds. : Brahms in the Home and the Concert Hall: Between Private and Public Performance (Cambridge: CUP, 2014). The present-day hunger for cycles—hidden, implicit, unknown or concealed—seeks to feed the appetite for a recital format favoured, perhaps over-favoured, in the twenty-first century, but almost unknown in the nineteenth. Brahms’s friend, the baritone Julius Stockhausen (1826–1906) was denied the voice that would have enabled him to have an operatic career. Like other intelligent singers who have found themselves in this position, he made a living by exercising considerable ingenuity when it came to his creating opportunities to sing lieder. It was Stockhausen who suggested performing the Magelone-Romanzen as a cycle, later even mooting the participation of an actor—in a letter to the composer on 17 July 1889 he confesses that in a performance by his students in Frankfurt exactly this had happened—‘although I sadly doubt you might approve of even a few introductory words to these songs’. Stockhausen believed the public (who had loved the mixture of word and music) needed help to appreciate the music, that the Magelone-Romanzen were not well known, and that few people read Tieck—this is exactly why, of course, the cycle continues to be presented in this way. Nevertheless, Brahms had not intended these songs to be performed as a cycle with spoken text. Far from being offended that his Magelone-Romanzen should be performed singly, this is exactly how he wanted, and expected, them to be presented. As it turns out, there is no record (beyond a non-verified mention from Friedländer) of a complete professional performance by a single singer of the cycle in Brahms’s lifetime. Singers cheerfully browsed through the cycle, selecting their favourites. In the list of the songs’ first performances there are many female singers. The vocal challenges of performing the entire cycle have restricted the number of times these songs have been heard, and female singers are unwilling to do them if they have to give a complete performance and play the role of Peter of Provence at the same time. Perhaps it is not essential to present Die schöne Magelone as an entity, and as a connected story. The Romanzen form a somewhat unequal anthology of love songs, many of them truly wonderful, bold and experimental, all of them crafted by the genius of the young Brahms. According to the composer’s own testimony, he was so taken up with his musical response to their individual challenges that he paid far less attention to Tieck’s ongoing narrative. By insisting on the cyclic integrity of this work in performance, particularly if it involves an actor, we are perhaps getting in the way of more of these songs becoming everyday items on recital programmes. There is a strong argument for believing that Brahms would have felt exactly that. I am grateful to Dr Natasha Loges for the chance to consult her chapter entitled ‘The Limits of the Lied: Brahms’s Magelone-Romanzen Op. 33’, from the book detailed above, in advance of its publication. For this recording an interleaving encapsulation of the story is provided, translated from Tieck into English by Judy Hildesley, between each of these songs. (This reading version has been slightly shortened.) The listener can easily move from narration to song translation by simply ignoring the intervening commentaries, the recommended way to first approach this work. Freed from an obligation to honour Tieck in his original language, Judy Hildesley was able to make a paraphrase, conserving many of the details of the original while eliminating anything that threatened to hold up the momentum of the music. I am extremely grateful to her for permission to use this version of the story.